The Recruiting Service Innovation Awards (ReSIs) are designed to recognize the individuals, organizations, products and services that are having a significant and beneficial impact on talent acquisition. They celebrate the Innovators and Innovations that optimize the recruiter’s experience. The ReSIs are conducted by the International Association of Employment Web Sites, the trade association for the global talent acquisition solutions industry. Participation in the competition is open to all organizations worldwide that operate in that industry. 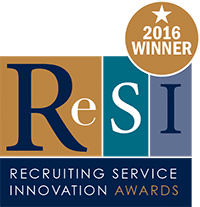 To learn more about the ReSIs as well as the other award winners and nominated companies, visit: http://www.employmentwebsites.org/recruiting-innovation-awards.